I’ve been living a stone’s throw away from Cafe Spice Namaste for over 3 years now, and in that time have been both marvelled and at the same time frustrated by Cyrus Todiwala’s intricate and inventive fine Indian cuisine. I must admit though, I don’t think my palate is yet able to discern between a good curry versus a truly great curry. Hence, I still find it very difficult to stray from my East End creature comforts of Needoo and Tayyab‘s (where a tenner goes ever so far) and pay double or thrice the amount for more upmarket Indian food at the Benares-es and Cafe Spice Namaste-s of this world. I’ll start on a high-note. Mr Todiwala makes a damn fine chutney indeed. Whereas at your average Indian restaurant you may risk slightly stale and often overly-punchy varieties, the chutneys here are fresh, balanced and multi-faceted with layer after layer of complexity. Have it once, and I guarantee, every time you have another just-average Chutney at your local Indian, you will think where o where is Mr Todiwala when you need him. I’ve contemplated on many an occasion rocking up here for just the Poppadoms with Chutney alone. Now, onto the lows. And mind you, the lows are nothing to do with the quality or taste of the food at all. What drives me mad about this place are the microscopic portion sizes of some of their dishes. Judging from the £7.75 price tag on our Dynamite Squid starter on our most recent visit, Jo and myself were under the impression it would be big enough for the both of us to pick at and share. What showed up though was 7 measley rings which were barely larger than your standard 10p coin each. Despite the wonderful crisp of the lentil flour batter and the the delectable heat from the Goan masala sauce it was served with, we couldn’t help but feel robbed as we polished the plate of every crumb to recoup our losses. Our main course of Goan King Prawn Curry was equally as frustrating. 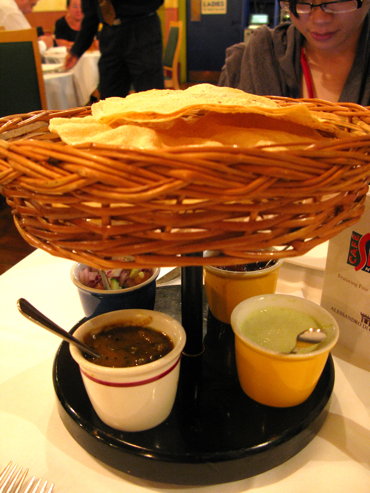 The curry itself was actually very, very good – a sauce fit enough for even the most fussy of curry connoisseurs. Luxuriously creamy and coconnut-y, it had a great balance of sweet and savoury and a delicate undertone of heat from the chillies. What I did have a problem with again, was portioning. 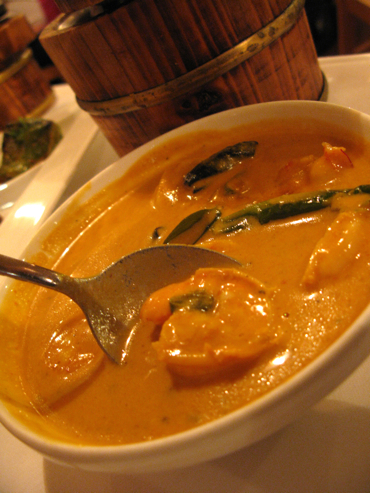 With a grand total of six not-very-kingly prawns, its no surprise we had to stir around to even find them. Robbery (yet again). 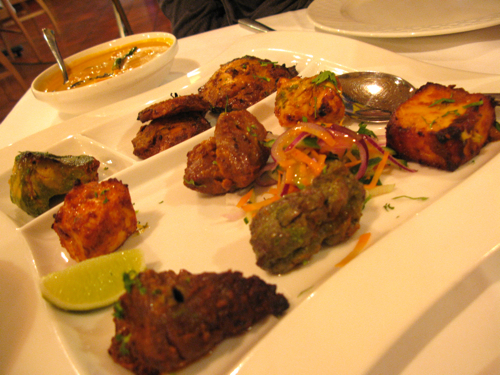 Thankfully, the Mixed Tandoori platter arrived to save the day – a fantastic spread of all of Cafe Spice’s Tandoor oven specialities. Goodies ranging from Paneer Cheese, to Salmon, to Poultry, even Venison, were set before us on a large platter. This was a Tandoori-lover’s dream come true. As you chewed and savoured the different textures and flavours of the marinades and meats, you could tell that care and meticulous attention to detail had gone into the construction of each and every piece. One really stood out head and shoulders above the rest. Duck Tikka a’la Mrs. Matthew was char-grilled perfectly to a medium-rare. Named after one of the old masters of Keralan cuisine, Mrs Matthew’s yoghurt and tamarind based marinade complemented the Barbary Duck breast superbly. With each bite of the tender breast meat, all the other elements of the marinade then began to take their form in turn… fenugreek, ginger, cardamon then the mild hit of chilli just at the very end. To think the entire platter was only 45 pence more than the miniscule Goan curry… it certainly went a long way in ensuring we didn’t go home hungry. No other neighbourhood restaurant has managed to provoke such ambivalence in me. In spite of the lows though, the quality (not quantity) of food, Chutneys and Tandooris mean i’ll probably be back through its doors again (and again). Sounds like the portioning of the Scallops is even worst than the 6 prawns we were served. Food as you say is quite nice though. I will go back though only because (a) Im addicted to the chutney and (b)its the nearest restaurant by distance to my flat as i live round the corner. Thanks for stopping by. I can explain and agree at times too. The reason why the quality of the food is so high is also because we buy only the best of the best and as a result pay over the odds for our raw materials and hence the pricing is difficult to balance for us. However we have since reviewed the portions and I do hope that what we now have on offer is suitable to most. However the SQUID has definitely increased beyond eight rings for sure, but they are still an individual portion. Please next time round try the Chefs special menus and do let me know personally whether or not you get total value for your money. Many thanks for all your efforts and fpor the fabulous pictures. Hi Cyrus, thank you for stopping by. 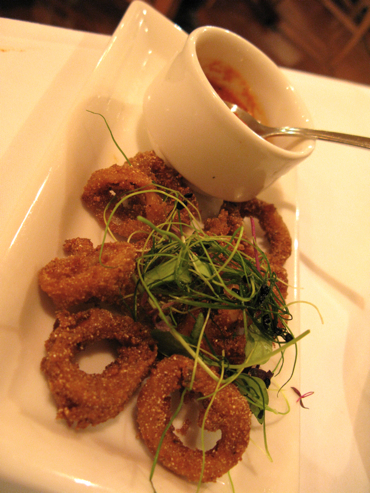 It’s good to know you have since reviewed the portions of some of your dishes such as the squid. I definitely would have mentioned it to you personally had you dropped by our dinner table that day but you looked extremely busy that night. Despite our disappointment with the Squid and Goan King Prawn portions on this particular visit, we have actually been back to Cafe Spice several times since. We recently had your 15th Anniversary January set menu and thought it was great value. We passed our compliments personally to your wife after our meal. 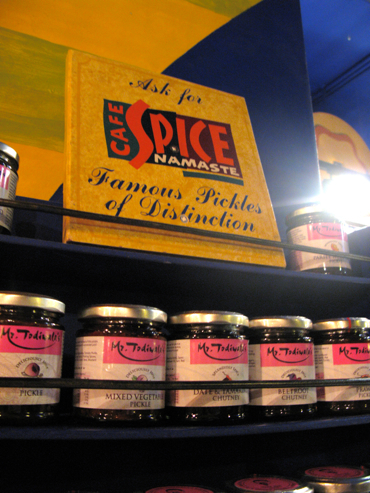 We will be back soon one of these days – the truth is we love your Chutneys and Tandoor Platter too much to stay away. Hope to meet you personally one of these days.